For the year 2007, there were six courses offered, as follows . . .
For the year 2008, there were two courses offered, as follows . . .
For the year 2009, there were seven courses offered, as follows . . .
For the year 2010, there were eight courses offered, as follows . . .
For the year 2011, there were four courses offered, as follows . . .
For the year 2012, there have been three courses offered thus far, as follows . . .
For the year 2013, there has been one course offered thus far, as follows . . . 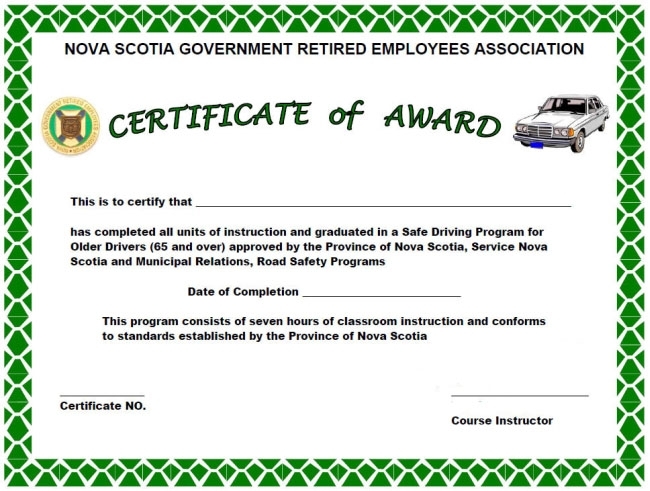 The NSGREA's Safe Driving Program for Older Drivers meets the standards established by the Province of Nova Scotia, Service Nova Scotia and Municipal Relations and is approved by the Department. A participant need not be a member of NSGREA; however, priority is given to members. Courses will be arranged for each region of NSGREA province wide - to register for a course or to obtain further information please call NSGREA's provincial office in Lower Sackville at 865-5050 or 1-800-677-8666.
especially for SENIORS entitled "The Older and Wiser Driver".